I am not referring to Bristol-Myers Squibb as I have no reason to have any feeling towards that organization. Today it is all about borane-dimethylsufide (BMS), which is a well-known borane reagent in synthetic organic chemistry. The complex has a lot going for it, such as good solubility in organic solvents and increased thermal stability compared to other borane reagents. Over the years, I have marvelled at the versatility of BMS. Today I have read a great paper by the Kanai team from Japan. This JACS report suggests a new use to the time-honored reagent. Below you see what happens to a fairly elaborate acid-terminated substrate. The authors were able to demonstrate that engagement of the acid by a catalytic amount of BMS results in the formation of a boron enolate, which later enables Mannich-type chemistry. DBU plays the role of a stoichiometric base here. There are not many ways to run similar chemistry using acid precursors, which is why this report is a pleasant surprise, especially given the simplicity of the reaction conditions. The paper also reminds us of Zakarian’s alkylation chemistry (http://pubs.acs.org/doi/abs/10.1021/ja205107x), which is another example of how one can effect direct transformations of enolizable carboxylic acids under fairly mild conditions while using inexpensive reagents. It is always exciting to witness when fragment-based approaches start from fairly mundane molecules and lead to potent inhibitors of enzyme function. By way of a reminder, in fragment-based drug discovery, screening of low molecular weight scaffolds is initiated with the goal to find weak, yet small, binders. The key is to locate scaffolds with high ligand efficiency (the change in free energy per non-hydrogen atom). The tools for measuring these intermolecular interactions range from protein/ligand co-crystallization to HSQC NMR. Progressive rounds of improvement lead to gradual transition to better and better molecules. A major limitation of this approach is when the inhibitor must induce substantial protein reorganization. Indeed, weakly binding fragments are not able to cause movement of large protein segments. If you wonder whether or not fragment-based approaches have already resulted in drugs on the market, there are some notable examples out there. The most intriguing of them is that of Vemurafenib, the first drug approved for BRAF-mutant cancer. There is a great paper that details how this molecule was developed (http://www.nature.com/nrd/journal/v11/n11/full/nrd3847.html). Below I am showing a rough progression from the initially found small fragment to the larger, more “obese”, molecule. What’s interesting to me is that the process of gradual improvement did not center on the same kinase. If you follow the history of Vemuratenib, you will realize that the incremental improvement in potency corresponded to using different kinase isoforms at each step. This is an interesting twist that shows that fragment-based approaches are particularly well suited when you have many isoforms. I am not sure people stress this enough. One of the protein targets we work on in collaboration with the SGC (Structural Genomics Consortium) has delivered some interesting hits. Our target is not a kinase (more on that some other time). We now have several compounds that show binding and co-crystallize with our protein. However, the proof for the effectiveness of this approach will come once we improve the initial hit, which has been problematic (we are still in the millimolar range). Honestly, it is somewhat disappointing to see a crystal structure with several good looking hydrogen bonds between your protein and its binder, only to be unpleasantly surprised by the low affinity of the interaction. I think if we had more target isoforms, similar to what the kinome offers, we would be able to move faster. Bad odor is often the biggest barrier between some interesting reactivity and scientists. Of course, toxicity is also a challenge, but lethal molecules can be tamed in trained hands. Odor, on the other hand, is pervasive. This tends to stop many reactions from reaching the mainstream of chemistry. It’s rather sad, especially with such versatile reagents as organosulfur compounds. We don’t even need to go that far: dirt cheap elemental sulfur is rich enough in what it can do for you. This brings me to the main subject of tonight’s post: the Willgerodt-Kindler reaction, one of the more bizarre and ill-understood processes at the fringes of organic chemistry. Despite what’s written about this fascinating process, you won’t find a definitive account describing the mechanism of the reaction. Some hints do appear from time to time. Below you see the reaction itself on the left. In the box on the right I am presenting a curious result obtained by Hartung and colleagues (the reaction medium – Dimsulf – is awesome). This is considered to be as close as we get to isolating the relevant intermediate of the Willgerodt-Kindler reaction. All of this is rather confusing, but my friend Professor Carsten Bolm did a nice overview of the reaction not too long ago (the last link). I wanted to talk about something really sweet, but last Friday’s encounter with my friend and colleague Dwight Seferos has been lingering in my head over this long weekend. Dwight brought to my attention a recent Angewandte paper by Yan, Zhang and co-workers. Upon reflection, this might represent another example of not using Occam’s razor (see my previous post: https://amphoteros.com/2015/02/24/treading-lightly/). But… There are other issues here, more systemic in nature, and I would like to comment on those. The reason for this paper being “the last straw” for me is that more and more frequently I see bastardization of structures in materials’ science papers. The impressive recent traction received by Abbvie’s Venetoclax is the subject of today’s post. Dr. G. Poda of OICR brought this molecule to my attention. 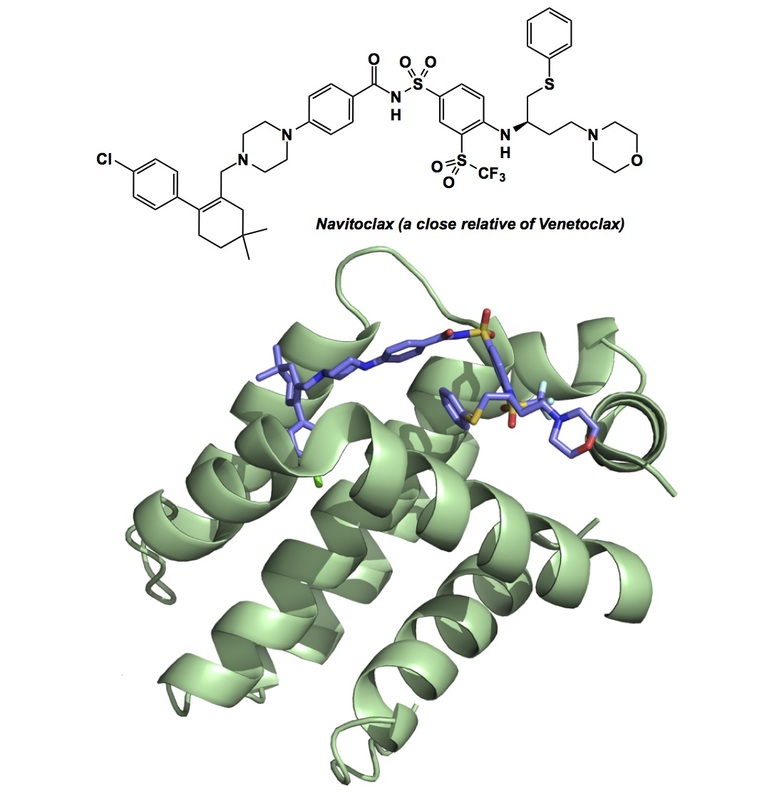 Venetoclax constitutes a notable addition to the growing list of small molecule inhibitors that target protein-protein interactions. The compound just got the breakthrough therapy designation from the FDA, which speeds up the regulatory review process (http://www.dddmag.com/news/2015/05/abbvie-receives-breakthrough-designation-cancer-drug). A potent inhibitor of the B-cell lymphoma-2 (BCL-2) protein, Venetoclax shows once again that small molecules (more on that later…) can inhibit fairly extended protein interfaces. Below I am showing a view of the co-crystal structure between BCL-2 and one of Venetoclax’s close relatives – Navitoclax (pdb ID 4LVT). The last 10 years have witnesses a ton of research aimed at the BCL-2 family of proteins with all manner of synthetic tools thrown at this challenge. You probably saw stapled peptides developed by Verdine and Walensky. Abbvie’s compound now nicely fills the coveted hydrophobic patch while showing clinical efficacy. If there were such a thing as chemical aesthetics in drug design, Venetoclax would probably not get the top prize. I am sorry, but this is one ugly molecule with all sorts of weird overhangs. Some of the structural features remind me of the mess the construction crew left in our basement two weeks ago. Those guys did a decent job in terms of the ultimate functionality we desired, but we did have to always watch out that the never-ending adjustments would not take a toll on the aesthetics. Coming back to Venetoclax, calling it a small molecule is a stretch. Despite all of this, I am drawn to this structure, no matter how clunky it may look. Venetoclax is a nice way to showcase the merit of elongated molecules, which I have been developing quite an interest in. One of these days I will write a paper dedicated to inhibitors that look like sticks. I do think they occupy an interesting niche (as do macrocycles, but those serve a more “circular” purpose). A couple of weeks ago, Professor Carolyn Bertozzi (she is now at Stanford: https://chemistry.stanford.edu/chemistrynews/carolyn-bertozzi-join-chem-h) asked me to comment on a paper published by Professor Frances Arnold and colleagues at Caltech (http://cheme.che.caltech.edu/groups/fha/). Of course I agreed. It was difficult to say no to such a fine piece of work, which just appeared in ACS Central Science. My long-standing claim has been that nature does not know how to make C-N bonds by oxidation, which culminates in the inability of biosynthesis to produce aziridines (and other amines) by oxidative C-N bond formation. I do not want to dwell on the salient features of the Arnold approach because I already said enough in my commentary on this new way to coax p450’s to make aziridine rings. “Dear Professor X, I regret to inform you that your paper is not good enough. Sincerely, the Editor”. “Dear Professor X, we have carefully considered your proposal. Unfortunately, we cannot be supportive of your submission because our journal publishes only good papers. We suspect that yours won’t be one of them. Sincerely, the Editor”. I really enjoyed reading Chris Vanderwal’s synthesis of kahalinol B published in JACS not too long ago. As someone who has had a keen interest in the chemistry of isocyanides, I have been attracted to the structure of kahalinol B and other natural products containing that venerable “NC” functionality. I am sure you all agree that these isocyanide transfer reactions represent very elegant ways to use TMSCN, which is typically known for its role as the cyanide donor. That TMSCN can act as the isocyanide source with alcohol and epoxide electrophiles is leading some students to suggest to me that this whole TMSCN/Lewis acid business might be a cool way to make novel isocyanides for multicomponent reactions. To that I say: “Sure, but let’s take a sober look. Why is it that no one feels any burning desire to cite Professor Paul Gassman’s contributions to this area?” I am not sure, maybe I am way off here, so you can be the judge about whether or not any of the recent isocyanide transfer reactions need to mention Paul’s name. Paul was a well-regarded scientist, by the way. He was the President of the ACS and, in his free time, published on the “isocyanide/smart Lewis choice” idea in JACS back in 1982 (see the link below). As a matter of fact, he even had the well-known OrgSyn prep dedicated to this chemistry (the last link below). You all know what that means: his epoxide ring opening reactions were no fluke. I think people need to acknowledge these seminal contributions for what they were, namely precedent-setting advances (which are important to cite).